EFDN- What role does football play in supporting refugees? 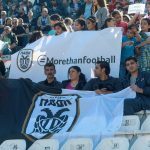 The #Morethanfootball Action Weeks have dedicated the 3rd of April to CSR programmes that aim at Supporting Refugees. 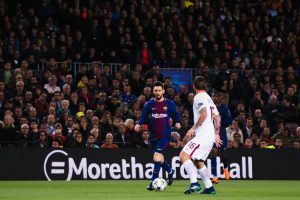 Within the framework of the Action Weeks initiative, this day gives all organisations the opportunity to highlight in particular the opportunities and social power that football has to help refugees integrating into society and overcoming barriers. 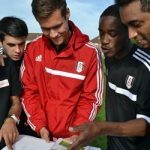 The European Football for Development Network will use the 3rd of April to introduce some of the Community and Social responsibility programmes that EFDN member clubs are delivering in this field. The last years saw more than a million people cross the Mediterranean to Europe, fleeing their homes and the dire situations in Syria and Libya in search of international protection. For Europe, integrating refugees in society is one of the next big challenges – what can sports and in particular football contribute to the process of social integration? In the past years, the integration of refugees has become one of the most pressing tasks, which the European countries face. Some of the problems, which the people who are escaping war face are long-term integration in society, language barriers and the re-settlement of individuals and families. By now, many initiatives on all levels have been created to tackle the growing issue. Major efforts have also been taken by a number of football clubs, football organisations and football initiatives since football has shown to possess the capacity to help people integrate into society. Case studies and reports show that refugees have increasingly become involved in grassroots football clubs throughout Europe. A great number of activists and volunteers contributed to realising those football intervention programmes. EFDN believes that sport and in particular football can be a powerful tool to support the new arrivals in the challenges they face, including working towards a safe integration. Among others, football organisations have contributed to the process of integration by simply providing an environment to connect and make friendships through playing football. However, also a diversity of education and employment programmes across Europe have been set-up to support new-arrivals. Also a number of EFDN members, and the network’s strategic partners have shown their belief in football as a tool for integration by implementing diverse programmes. EFDN’s partner, FARE provides very detailed information on European- wide initiatives regarding the topic of social integration. The network has developed a comprehensive database encompassing grassroots organisations, teams and football clubs that are actively welcoming refugees or organising training sessions and other initiatives to help refugees find a place. Established in 2015, this project delivers high quality football sessions to asylum seekers and refugees in partnership with Asylum Link Merseyside. Over 200 individuals have benefitted from the sessions which are supported by Former Everton player Pat Van Den Hauwe. There are a number of asylum seekers and refugees who have been re-located to Liverpool and are unfamiliar with the area and struggle with various issues, including language barriers, which this project plays a key role in addressing alongside facilitating integration and creating a safe haven. The project is funded by LEAP (Liverpool East Active Partnership) and offers two sessions every week. LEAP is part of a physical activity and sports programme delivered by Liverpool City Council and financially supported by Sport England’s ‘community sports activation fund’. The aim is to encourage fundamental recreational activity on a regular basis and help Liverpool people to adopt a long-term healthier lifestyle. The programme #WithRefugees includes the coordination of providing basic material to refugees. The first step of the extended programme was made on 7th of February 2017 on the refugee hosting site of Alexandria Imathia in cooperation with UNHCR (United Nations Refugee Agency) and supported by the Ministry of Migration Policy and its Regional Asylum Office of Northern Greece and Eprius. More and more people flee from crises to Germany. Since 2013, Bremen has also increasingly been discussing opportunities for help für refugees. In 2015, 10.274 refugees and about 2.500 unaccompanied minors came to Bremen. SV Werder is working with his partner REFUGIO to help refugees and asylum seekers in Bremen. Werder’s CSR brand WERDERBEWEGT – LEBENSLANG makes it possible for a large number of young people to find a sporting home – as an athlete and as a coach. As part of the SPIELRAUM project, Werder Bremen offers an open football training in four different areas of Bremen. The same counts for Table Tennis, where training courses are provided since a year. In addition, at the beginning of 2016, sports activities were made explicit for girls. “Bleib am Ball gives the children and young people the possibility to spend their free time on the football field and find a safe place. It gives them the opportunity as other children to have their own football group. Furthermore, older people who had fled find a place to work for an with young people and give them help to create a safe future”. Anne- Kathrin Laufmann, CSR Director. The “Willkommen im Fußball” (“Welcome to Football”) programme includes over 20 clubs from the Bundesliga and 2nd Bundesliga from all over Germany that are involved in refugee-welcoming alliances, organising easily accessible sport and training opportunities for young refugees. 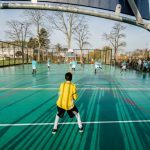 “Welcome to Football” is a programme of the German Children and Youth Foundation, funded by the Bundesliga Foundation and Federal Government Commissioner for Migrants, Refugees and Integration. In the EFDN Online-Learning Platform, we provide several resources addressing the topic of integrating refugees into society, ranging from volunteering to challenges and trends. The handbook can be used as a guide for potential volunteers in sport with a migrant background or for local clubs and sport organisations interested in involving people from diverse background. The overall vision of the project “European Sport Inclusion Network (ESPIN)- Promoting Equal Opportunities of Migrants and Minorities through Volunteering in Sport” is to increase sports participation of disadvantaged groups by promoting equal access to organized sport. A key objective is to increase volunteering of migrants and minorities.